The initial business focused on providing premium logistic services – packaging, storage and transportation of frozen food for both local and international partners. Frigorifer became the largest frozen food Storage Company and sales company in Eastern Europe at the time. Frigorifer expanded its business to include the production of frozen vegetables. 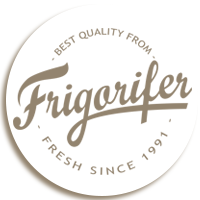 Frigorifer was acquired by businessman Mr. Mounir Halawani. Casa Ţărănească, frozen vegetables brand, saw the light and shortly became the brand leader in the retail business. Frigorifer started massive investments in upgrading the Tulcea facility and in improving its frozen meat and vegetable storage services. Edna, frozen vegetables brand, saw the light. Smithfield, one of the largest food companies in the US since 1936, acquired 50% of Frigorifer’s shares and the company strengthened its two lines of business that it has continuously been active to this date: frozen vegetables and logistic services. By then, Frigorifer had been supplying half of the amount of frozen vegetables sold in the Romanian market. Frigorifer was acquired by Halvest sal holding (60%), and Spaskort Holding limited (40%). Casa Pescărească was created as a premium quality brand encompassing a range of seafood products. We started in the refrigeration business then grew into storage and transportation to reach our expertise today in frozen food by having our own private brands. And we will not stop here. We permanently learn, diversify and adapt to the needs of our partners and our consumers who enjoy our products every day in their homes. This is our idea of freshness!